Since About.me set the standard for how to create a splash page, giving users one place to link to their many online profiles, we’ve seen quite a few niche spin-offs targeting musicians, small businesses and professionals. The latest of its kind, Pictually has joined their ranks, with a unique twist which will appeal to photographers and visual artists. Heading over to Pictually, you have to request an invite to sign up, but the site is actually in public beta, so there is no wait. You’ll instantly receive an email prompting you to create your Pictually profile. The process on Pictually is extremely easy. The first thing you’ll want to do is enter your profile information. This consists of a ‘subtitle’, bio, and profile photo. The profile photo will not be displayed on your homepage, appearing instead on a separate ‘About’ tab. The next step is where you can get all of your social profiles featured onto your Pictually page. Supported services include social networks (Twitter, Facebook, Google+, Instagram), blogging platforms (Tumblr, WordPress, Blogger), as well as a list of designer and photographer staples including Behance, Flickr, DeviantArt and more. The final step is what sets Pictually apart as a splash page option. In addition to uploading a background full screen image, you can also upload individual albums, to be displayed on a separate ‘Gallery’ tab. 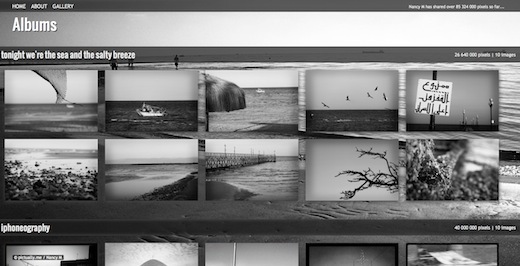 The catch here, however, is that you have to find a background image which will not distract from your photos, as albums are displayed one after the other, as a grid of thumbnails over that image. Individual photos from your albums can also be featured on your front page, if you want visitors to see the very best of your work the minute they land on your Pictually profile. If we had just one request, it would be the ability to change the background for each tab. That way, you won’t be limited when choosing a photo you want to showcase as a full-screen image on your homepage. Since this is the very first thing visitors are going to see – you want it to be good. 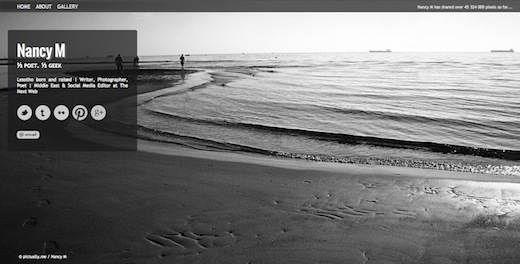 A plain or minimalist image would then work best on your ‘Gallery’ tab. Pictually is a great option if you’re looking for a quick and easy way to throw together a photography or artist portfolio. We’d be a little surprised, however, if a designer opted for a cookie-cutter site rather than come up with something themselves, particularly as Pictually still doesn’t allow users to tweak fonts, colours or layout. Pictually makes it easy to get an online gallery up and running in a matter of minutes, with the added and essential bonus of linking to all your profiles around the Web. The site can be used to complement a more comprehensive portfolio, by showcasing the very best work you have to offer, while linking to a complete collection elsewhere. What do you think of Pictually? Let us know in the comments.